Lately all I want to make are Game of Thrones cosplays. As impractical as they are for everyday life, they are gorgeous in construction. One of my favorite characters, as you all know, is Daenerys Targaryen. But, as I began to watch season 3, I started to really like Margaery Tyrell. I cringed at Margaery’s clothes from season 2 since most of them were a bit too revealing in the front for my taste. But her season 3 outfits, while still a little revealing, are less so – and mostly in the back. The dress I really fell in love with was the one she wears when she is consoling Sansa Stark after Sansa’s engagement to Tyrion Lannister. The open sides and not-so-low neckline were appealing to me, as was the design of the top and rose belt. I crafted my dress using McCalls 6941. The skirt was kept basically the same, but the top was modified using a muslim mock up to be cropped, have a closed back, and a closer to the neck collar. I used baroque satin for the skirt. It is my least favorite satin to work with since it is cheap and overly shiny, but it was the only satin that came in the color I wanted. To tone down the shine, I used the back. Margaery’s skirt is two layered but I didn’t want to deal with excess weight since this is being worn at an end-of-summer con. Instead, I have a separate cotton underskirt whose only purpose is to make sure I don’t have an unwanted silhouette when the light hits the skirt just so. The waist band is made from a teal colored cotton velveteen. The top is made from upholstery weight fabric in a tan blue pattern and blue cotton lining, also trimmed in cotton velveteen. Margaery’s top has a criss cross pattern on the back, but the back of my top is simplified; I didn’t want to deal with the frustrating of figuring out the criss cross. It closes in the front with four hooks and eyes. The skirt is attached to the top by two heavy duty hooks and eyes. 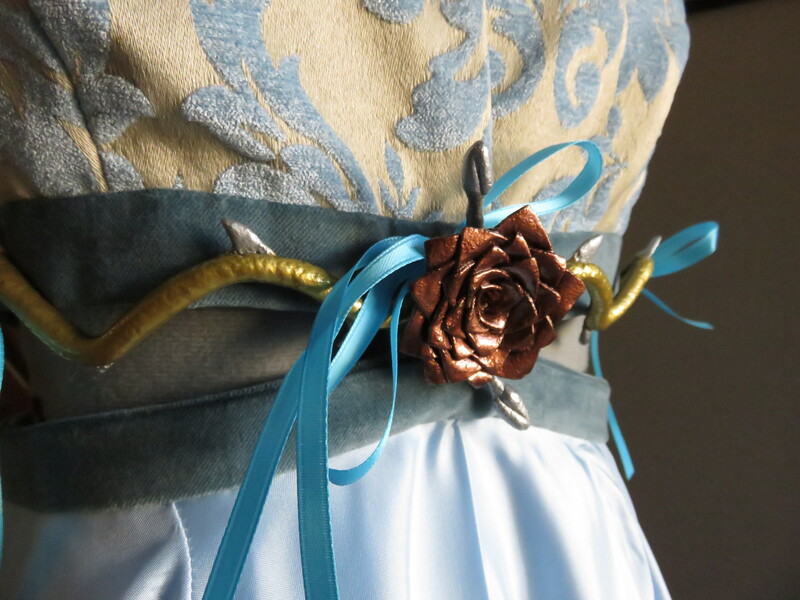 The rose belt is made freehanded style using worbla and acrylic paint. The paint is in colors bronze (for the rose), gold, and silver. Two primer coats of Mod Podge gloss spray, 5-8 coats of paint, then finished with 4 coats of Mod Podge to seal. I purposefully omitted the gesso and sanding priming step most cosplayers use when working with worbla; I wanted the knobby, uneven look, as if a real rose and its stem had been dipped in metal. 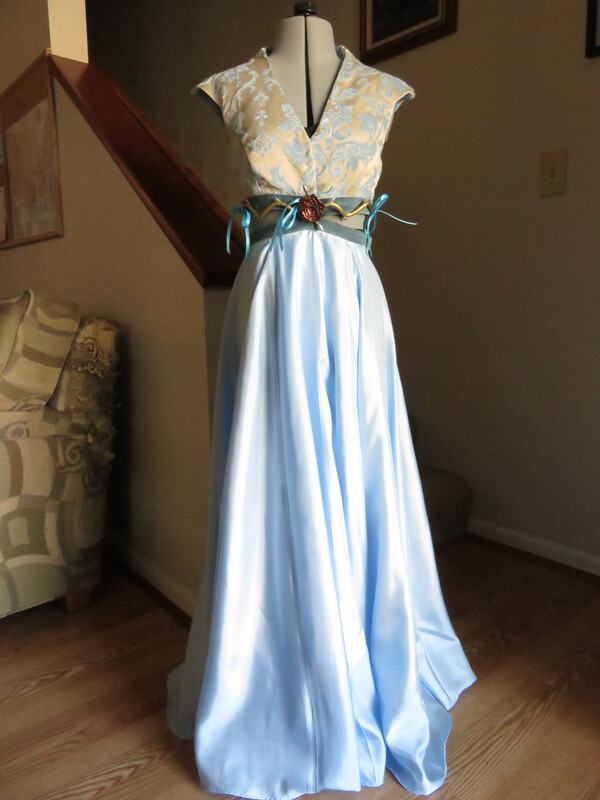 The belt attaches to the top waist band with three blue satin ribbons hand sewn to the top. I was really enthusiastic about making this dress – that was before I started work on Elsa. After I finished Elsa, my motivation just stopped. It was a struggle to finish Margaery in time. It’s not 100% up to my acceptance level but it’s function, fits, and everyone can recognize it.